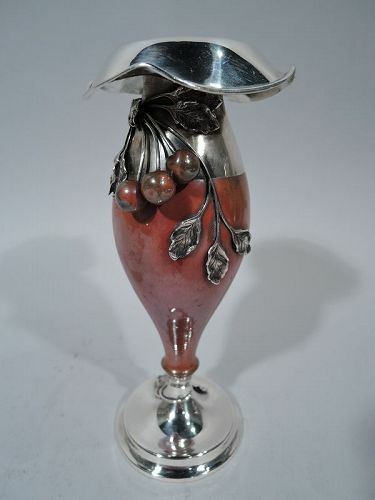 Mixed metal and silver vase. Made by La Pierre (part of International) in Newark, ca 1890. Baluster with turned-down and ruffled rim and stepped foot. Body is copper with silver foot and mount including rim. Applied silver branch and leaves with copper cherries. Hallmark includes phrase “Silver & Copper”. Good condition with nice patina. A few dings to copper body – but nothing to detract from the overall attractiveness. 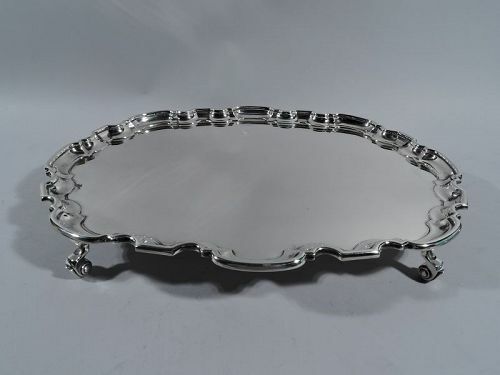 Modern sterling silver serving tray. Made by Tiffany & Co. in New York. Circular with well and molded rim. Hallmark includes pattern no. 21153 and director’s letter M (1947-56). Excellent condition. 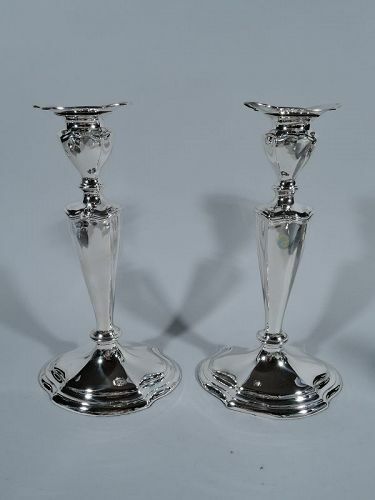 Pair of elegant sterling silver candlesticks in Hepplewhite pattern. Made by Reed & Barton in Taunton, Mass., ca 1920. Each: Tapering and chamfered socket and shaft on stepped and raised foot. Foot shaped and oval as is detachable bobeche. Hallmark includes no. 560. Very good condition. 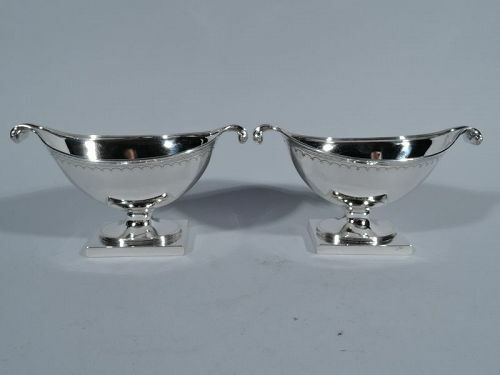 Pair of Neoclassical sterling silver sweet meat bowls. Made by Howard & Co. in New York, ca 1910. Each: Boat-form bowl with volute scrolls on oval foot mounted to rectangular base. Engraved bands of lines, arches, and waves. Reeded bowl and foot rims. Austere English-style elegance. Hallmarks include no. 676. Fine condition. 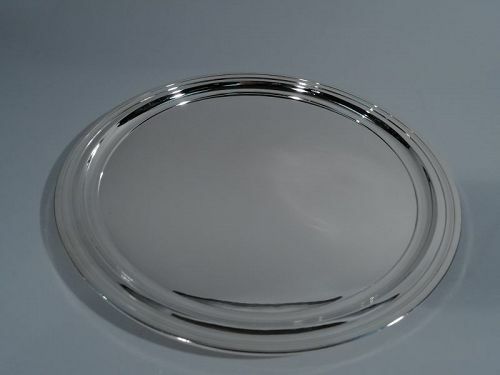 Modern sterling silver serving tray. Made by Tiffany & Co. in New York, ca 1928. Circular with well and molded rim. Hallmark includes pattern no. 21253 (first produced in 1928) and director’s letter m (1907-47). Very good condition. 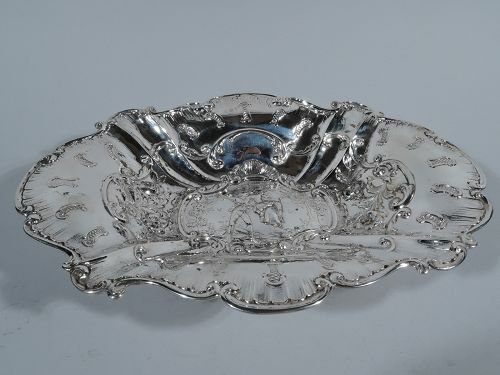 Edwardian sterling silver centerpiece bowl. Made by Gorham in Providence, ca 1910. Bellied with turned-down rim decorated with garlands and ribbon as well as applied scrolls and shells. Interior gilt with radiating flutes. Four volute scroll supports with fancy leaf-and-shell mounts. Hallmark includes no. A1753. Very good condition. 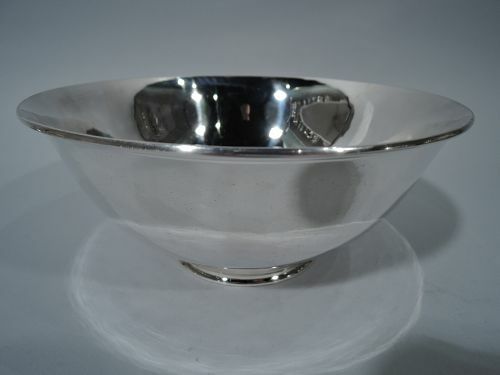 American Colonial sterling silver bowl. Made by Tiffany in New York. Bowl has curved sides and straight circular foot. Spare historic design that works equally well in Modern interiors. Hallmark includes pattern no. 19750, director’s letter M (1947-56), and phrase: “Reproduction / Original by / Joseph Conyers / Boston / about 1700.” Fine condition. 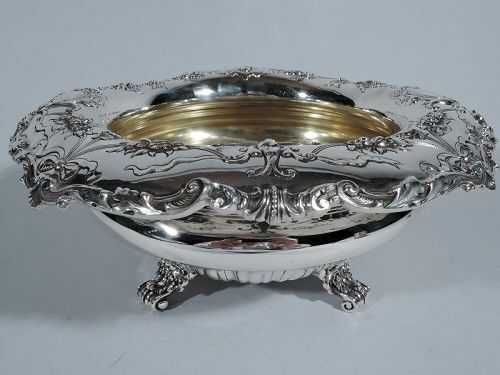 German 800 silver bowl, ca 1900. Ovoid with wide and flared mouth and 4 paw supports with leaf mounts. Chased and repousse scrolls and leaves. In well a gallant pushes a lady on a swing in a bower. A popular period motif sweetly portrayed. Rim has c- and s-scrolls and feathery leaf border. Hallmarked. Very good condition. 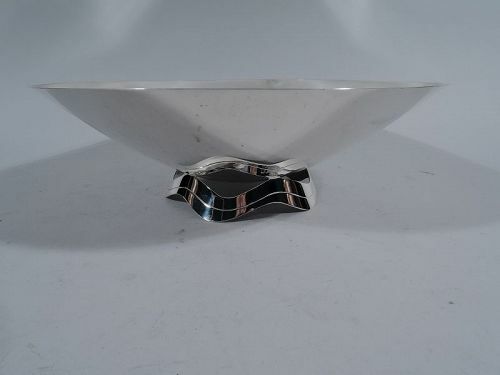 Midcentury Modern sterling silver centerpiece bowl. Made by Tiffany & Co. in New York. Shallow bowl mounted to scrolled and open ribbon support. The support is reflected in the bowl - a witty example of reflection as a design element. Hallmark includes postwar pattern no. 23428 and director’s letter M (1947-56). Very good condition. 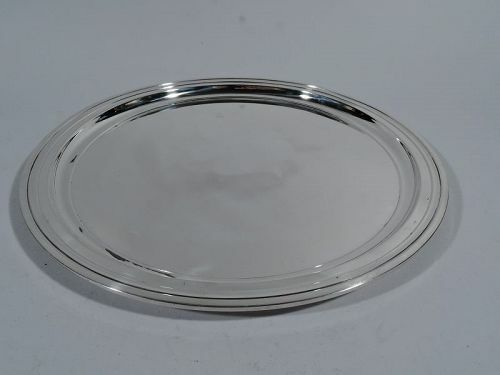 George V sterling silver salver. Made by Atkin Brothers in Sheffield in 1938. Oval with molded curvilinear rim. Rests on 4 capped volute scrolls. Traditional Georgian piecrust motif applied to a modern shape. Nice heft. Hallmarked. Very good condition. 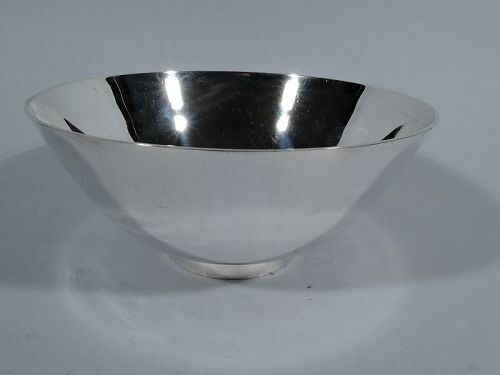 Sterling silver Revere bowl. Made by Arthur Stone in Gardner, Mass. Curved sides and stepped foot. Beautiful craftsmanship and traditional form. Hallmark includes initial T for Herbert A. Taylor, who worked for Stone from 1908-37. Good condition with nice patina. 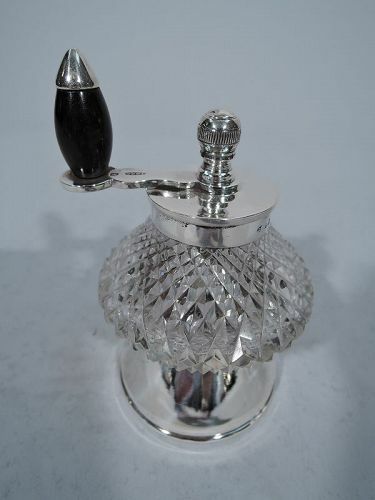 George V sterling silver and cut glass pepper grinder. Made by Grinsell & Sons in Birmingham in 1926. Clear glass bowl with cut diaper pattern mounted to raised and spread base. Flat circular cover and rotating handle with stained wood finial. Silver hallmarked. Hardware marked Peugeot Freres. Very good condition.